The Funniest Dinosaur Book Ever! 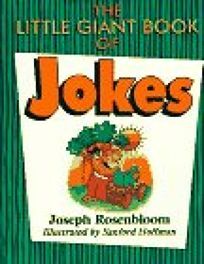 the laugh track The kind of goofy jokes that can make readers groan or giggle fill The Little Giant Book of Jokes and The Little Giant Book of Riddles, both by Joseph Rosenbloom, illus. by Sanford Hoffman. Riddles include such exchanges as ""Why aren't vampires welcome at the blood bank?"" ""Because they only want to make withdrawals."" Both fat, pocket-sized books feature simple, silly black-and-white cartoon illustrations.